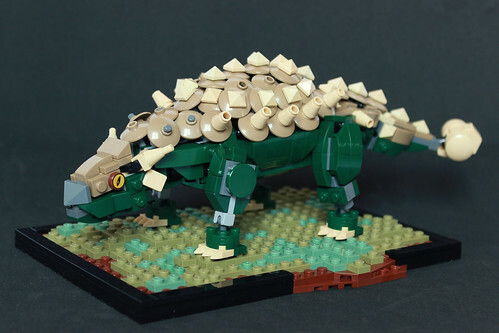 My Lego rendition of one of the most famous dinosaurs. I had the idea for the back armour, made with 2x2 dished attached with Mixel joints, several months ago, but didn't really know how to do it. It's only in May, inspired by the then-imminent release of Jurassic World : Fallen Kingdom, that I began to actually build it, starting with the body. I've built the tail quite easily, but it was more difficult to get the head and the limbs right. I was done by early June, but I had to wait a bit to order the parts because the MOC contains several of the new 1x1x1 brackets, which weren't immediately available on Bricklink. The model features 15 points of articulations for the head, the tail, and the limbs. For those who would like to build it, or those who would like to know how many Mixel joints are used (hint : a lot) you can check the model on Mecabricks. It contains several teal parts : you don't have to actually use teal, it's for parts that are concealed in the finished model, so you can use whatever colour you want.